The bright yellow floral display currently blanketing some lawns and roadway right-of-ways is being produced by Birdsfoot Trefoil (Lotus corniculatus, family Fabaceae). The yellow flowers are smaller than dandelion flowers, bigger than those of black medic, and resemble buttercups from a distance. This non-native plant was imported with good intentions, but is now gaining weed status in lawns, landscapes, and naturalized areas in Ohio. Yet another example of unintended consequences with introducing non-natives. Birdsfoot trefoil is a perennial, spreading, herbaceous legume that is native to Europe and Asia. It was introduced to North America for use in pastures or as a forage crop harvested for hay. The tough plants can survive and thrive where other forage plants, such as alfalfa, would wither away. Indeed, for years, birdsfoot trefoil was hailed as the answer to producing high-quality forage for cattle and sheep on marginal lands. However, over time, this Jekyll and Hyde plant has gradually transformed from a celebrated crop to an inglorious weed in turfgrass, landscapes, and naturalized areas. Plants spread by seeding, underground rhizomes, and above ground runners. Once established, individual plants spread quickly to form a dense mat. In lawns, mowed plants creep along the ground but bolt between mowings to tower above the surrounding turfgrass. In landscapes, plants may rise to a height of 20 - 40" to over-shadow annuals and even some herbaceous perennials. The dark green foliage has 3 leaflets at the tip of the leaves and 2 stipules near the base of the petiole making it look like it has 5 leaflets. The bright yellow flowers are sometimes tinged in red and grow in clusters of 5 – 10. The flowers and seed pods look like those produced by peas or beans which is no coincidence since they’re all in the same family. Heavy flowering, and thus seeding, occurs from mid-June throughout July and into August. The plant gets its common name from the very distinctive appearance of the developing seed pods; they resemble the foot of a bird. Infestations of this non-native opportunistic weed in turfgrass is associated with openings in weakened lawns so management begins with maintaining thick, healthy turfgrass. This includes proper fertilization and watering as well as cutting turfgrass high to support the development of healthy root systems. 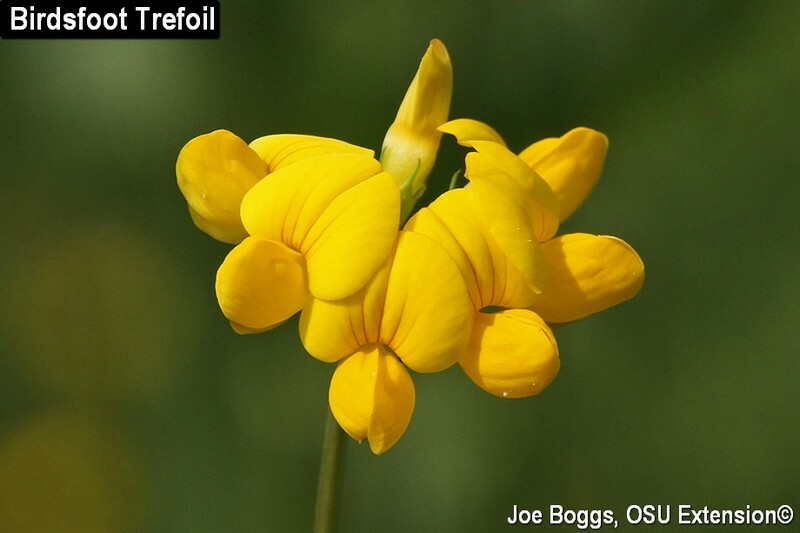 Fortunately, birdsfoot trefoil is susceptible to most post-emergent broadleaf herbicide products labeled for use on turfgrass; however, multiple applications may be required to exhaust regrowth from the rhizomes. Management in landscapes may require a combination of pre- and post- emergent herbicides as well as the judicious us of mulch to smoother the seeds.